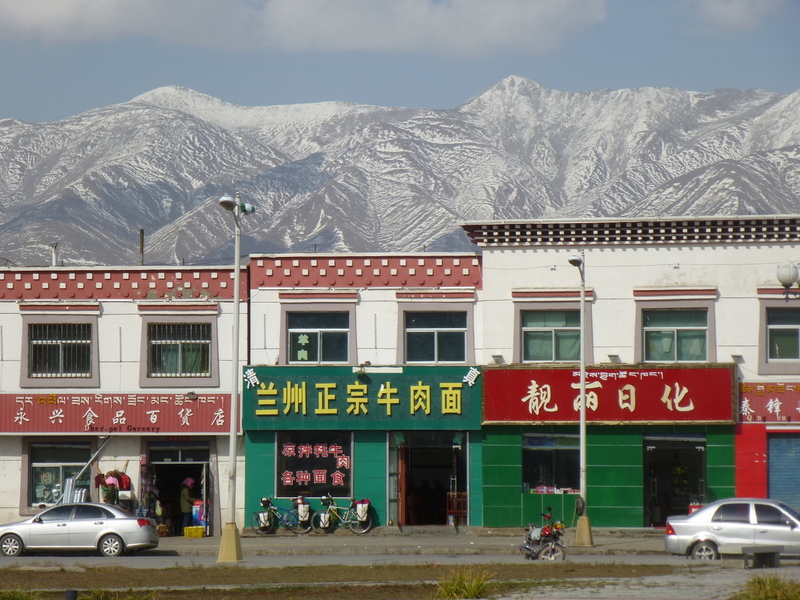 After resting for a couple of nights at a hotel in Qilian we were ready to start our ascent on to the Tibetan plateau. Unbeknown to us at the time, it was actually the last proper town that we were going to see for quite some time, so it was just as well we had a rest day (to recover from our previous bike pushing/trekking marathon) and get fully restocked – especially with porridge for breakfast as bread was no longer readily available. Unfortunately, the whole town was being dug up and rebuilt, and power cuts were frequent – in 2 days there was only 3 hours worth of electricity! It must have been a regular occurrence as the hotel instantly provided candles and the town hummed to the sound of power generators that ran outside every shop. This lack of electricity and thus lighting, might have been the reason why Tim found a plaster in his evening meal at a restaurant. It must be hard to tell the differences between finger and pork when chopping in the dark! The bikes outside a cafe – after a ‘lucky-dip’ on the mandarin menu, we ended up with scrambled egg soup! 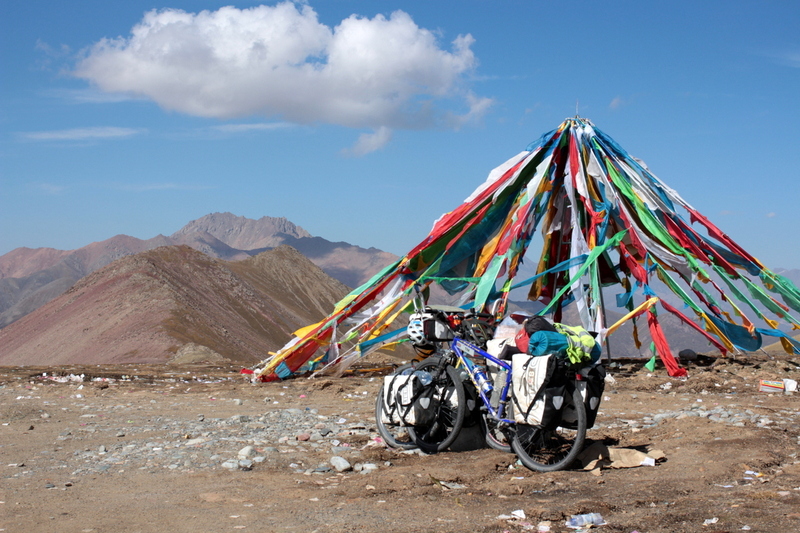 After the delights of Qilian we were quite glad to get back on the bikes and into the quiet of the mountains. The next couple of days of climbing and rolling back down again eventually took us up onto the Tibetan plateau and our first mountain pass which was covered with prayer flags at the top. The colourful flags were a beautiful sight and they seemed to be encouraging us to keep pedalling as they fluttered in the wind. Prayer flags and mountains at the top of a 4200m pass. 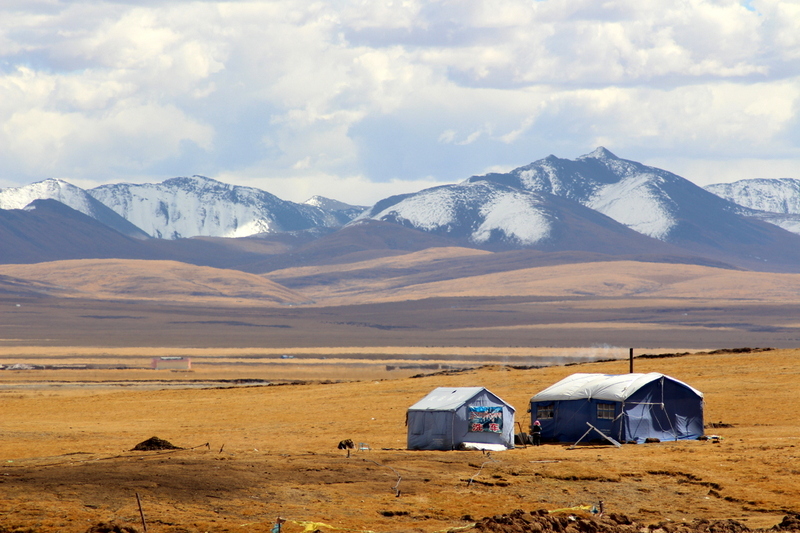 The Tibetan plateau has an incredible and beautiful bleak feel to it, with the vast majority above 4000m, the temperature was definitely chilly when out of the super bright and intense sun. The tent was covered by heavy frost as night temperatures got down to -8degC, with it not much better inside the tent! By wearing two pairs of socks, two pairs of thermal leggings, pyjama bottoms, thermal long sleeved top, cotton long sleeved top, cotton short sleeved top, fleece, body warmer, woolly hat, sleeping bag liner and our down sleeping bags pulled right up around our faces, it was only our noses that got a bit chilly during the night! Luckily the sun was so strong that when it popped its head up above the mountains it did not take long for us defrost, dry the tent and charge our solar charger meaning that the phone and camera stayed topped up even though electricity was rare. It took four weeks to get up to and across the Plateau, the lack of oxygen at altitude meant we got out of breath just packing up the tent and combined with the constant hill climbing meant that our average daily distance dropped quite significantly, it was several days between the towns. 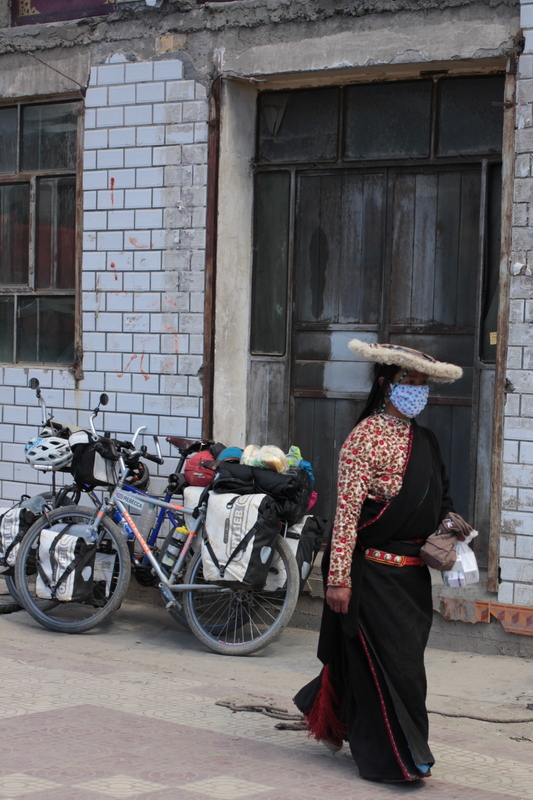 When we did reach somewhere, half its population would come out onto the dusty streets to have a good stare to see who had just rolled into town – it was as though we were starring in a Tibetan version of a ‘Wild West’ movie! 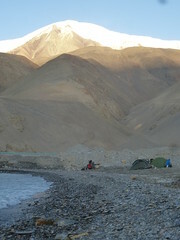 Not much up on the plateau but mountains and tents! Sometimes all the staring would get too much, it was as though we were aliens from another planet. People would literally stand (or sit) in front of us and watch as though we were televisions, sometimes we would also stop what we were doing and enter into a staring competition (which were usually very hard to win!). At other times we had a groups of silent ‘zombies’ following our every move. On one particular occasion, whilst sourcing provisions, we entered a shop where one of the assistants immediately spotted us, then pointed and said something like “strange white people” in a very loud voice (in Chinese obviously) making the other customers turn round and look. It was too much for Rebecca, so in an equally loud, over the top fashion, she pointed back and shouted out “Oooh, look Chinese girl!”. We were left alone for the rest of the shopping…..
You certainly should not go to Qinghai province if you cannot be without your creature comforts! We stayed in 7 hotels, none of them had hot water, 3 of them didn’t even have cold running water, (the water was stored in big plastic barrel at the end of the corridors). Only 2 of them had a shower, most of the time we were given a plastic washing up bowl and a flask of water for washing. (Hot water was from the yak-poo burning stove). The toilets were usually ‘outdoors’ – in wooden sheds that suspended you above a smelly earth drop where you had the ability to inspect the previous years worth of toilet usage (yuk). One in particular was an exact copy of the toilet from ‘Slum-dog-millionaire’ with the open ‘pit’ having two planks across the top where you stand/squat. Imagine Rebecca’s surprise to hear a funny noise ‘down below’ and then to look down and see a pig snuffling about! Mr Pig was just as surprised to see Rebecca as she was to see him, and he quickly trotted out into the main street still, with toilet paper stuck on his snout! Luckily we did not come here for the hotels though!! 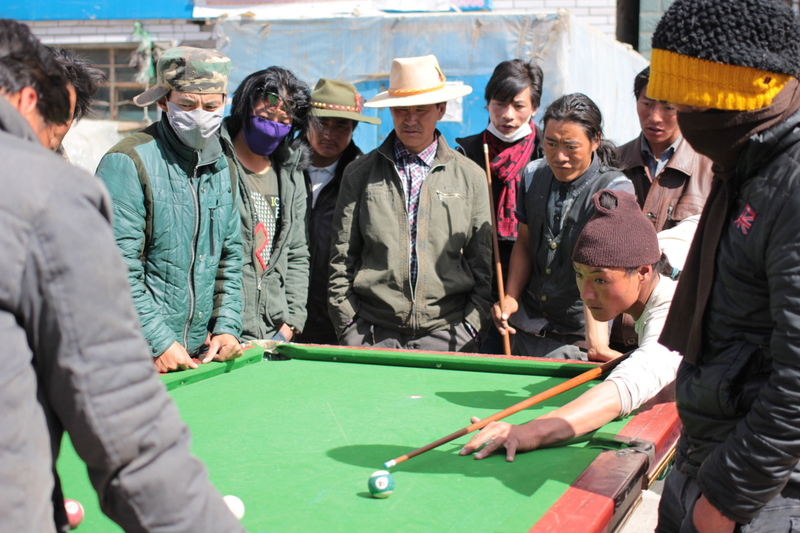 One of the many roadside pool tables – Amazing traditional dress, and headgear! The Tibetan plateau and Qinghai province has been the most incredible place for so many reasons. The remoteness of endless mountains and nothing else spreading out as far as the eye could see. The challenging behaviour of the people. The constant hacking up of phlem, then spitting it out on the floor, regardless of where they were – even indoors! The constant, never ending staring and pointing. 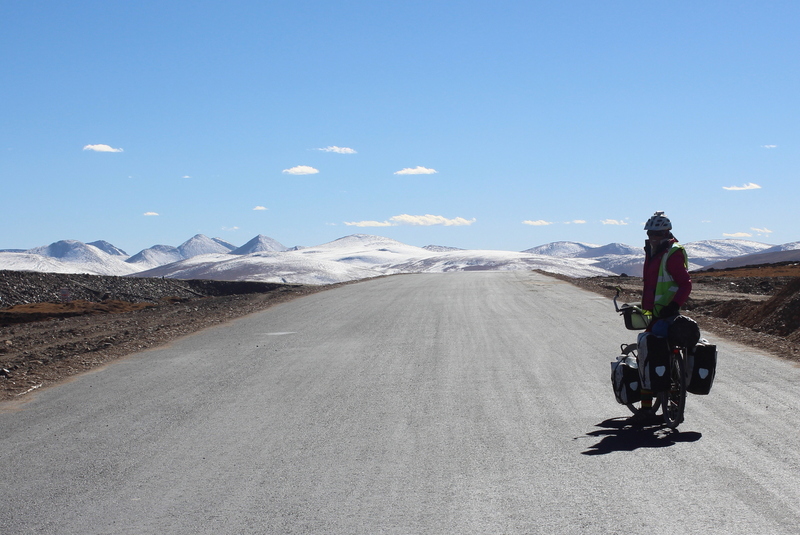 The challenges of high altitude riding causing relentless heavy breathing, but we reached 4824m, our highest point of the trip, all by pedal power. The bright intensive sun mixed with freezing temperatures meaning that we quite literally lived in the same set of clothes for days/weeks at a time. But most incredible of all, it has been the sense of adventure we have experienced, and that, after all was what we came for.